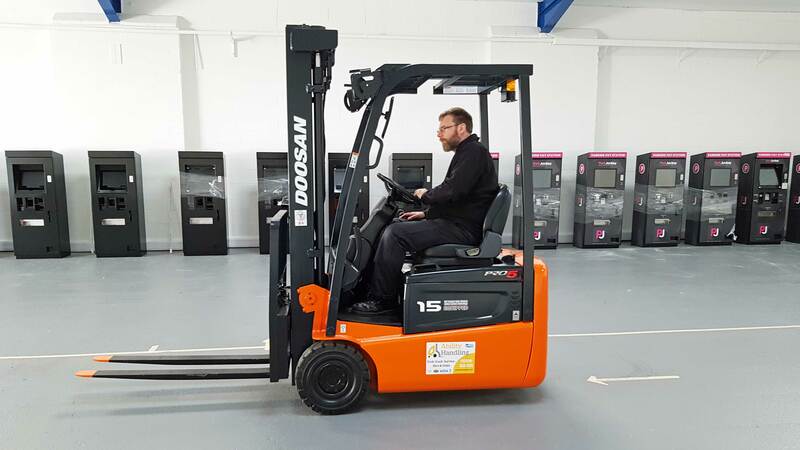 When a Castleford based supplier of bespoke kiosks, touch screens and digital signage solutions opened a second site, they required a reliable low cost forklift to leave on site at the new premises. Production Manager Steve James contacted Ability Handling to enquire what used machines were available as he didn't think it warranted a new machine for the limited use it would get. With a huge stock of used machines available at our Sheffield warehouse, we are usually able to find a used machine to suit any application or budget, and this was no exception. All our refurbished machines are overhauled using genuine spare parts and manufacturer trained staff. Our spray shop is able to paint machines to 'as new' standard and trucks are finished off with an original decal set. Only used machines of a high standard are selected for refurbishment and once completed, trucks are supplied with an accredited certificate of Thorough Examination plus a comprehensive parts and labour warranty. For this relatively light application, we selected one of our ex-hire fleet Doosan B15 machines, to be fully refurbished and fitted with a brand new battery for complete peace of mind. Happy with the specification and price, an order was duly placed and our workshops got to work on preparing the machine ready for the opening of the new site. If you are looking for a new or used forklift truck, contact Ability Handling today for a full selection.